Using Viseum’s Intelligent Video Analytics Software, Viseum’s Central Intelligent Video Management System (Viseum CiVMS) is the world’s most advanced and future-proofed Video Management System available today. Built-in Viseum iVOS™ video analytics software to fully optimize any existing network of CCTV legacy security cameras to automatically detect and recognize people and vehicles from close to long range, and at greater distances than any other Video Management Software. CCTV training and support and in-life compatibility issues between the many different systems and cameras – all delivered by Viseum in-house. Intuitively customised operations combined with the Viseum Intelligent Moving Cameras automatically alarm security staff for maximum situational awareness and the decision-support they need to react fast and effectively. This narrated presentation shows how any organisation can have the best future-proofed security for their entire security enterprise, with the best future-proofed Command Control and Communications, designed for and installed at any chosen location. Support rapid investigations to clear up crime in the most efficient way. Is your video management system lacking intelligent video analytics software? Do your CCTV cameras produce high-quality close-up video when needed? Do your CCTV cameras miss incidents and are they unable to provide effective cover to all your required areas? 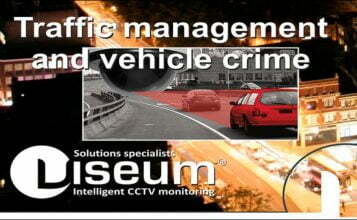 Are any of your surveillance monitoring installations failing to provide a CCTV deterrent? Do your remote sites require live monitoring using costly communications and monitoring infrastructures but still do not deliver results? 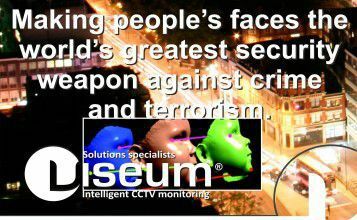 Viseum UK’s intelligent VMS software is proven to deliver the best results and the strongest long-term deterrent, with the most advanced security to cover all required areas thanks to the Viseum Panoramic Security Camera and Central Intelligent Video Management System (Viseum CiVMS). Independent endorsements show that it would take at least 6 times more installations of any other advanced outdoor pan, tilt and zoom or ‘PTZ Camera’ solution, or at least 10 of the industry’s latest panoramic megapixel cameras, or a minimum of 200 times more standard fixed camera installations, to provide the same level of security that each Viseum Panoramic Security Camera provides without being dependent on any surveillance monitoring infrastructure. If the suspect is wearing a hood or mask to cover their face – a positive ID can still be made. Solves the problem of having PTZ Cameras used to monitor remote wide-area sites, but without needing trained staff and without local knowledge of where the PTZ Camera should be pointing. More than doubles the strength of security, whilst more than halving the equipment and infrastructure needed to monitor and secure remote sites. Viseum UK’s video management solution achieves this as standard thanks to Viseum’s Central Intelligent Video Management System (CiVMS) and Intelligent video analytics. If any other VMS software achieves results of this standard, it is such a rare occurrence that it makes headline news. Intelligent video wall – includes intelligent video wall software – the video wall can be intelligently populated with close-up identification (ID) and recognition video evidence of suspects and events of interest as they happen. 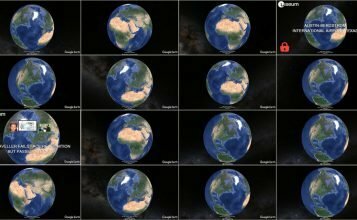 Multi-views – allows for multi-views for a complete 360 degrees view of the entire area at the same time. All or any one of the Viseum outdoor surveillance camera‘s fixed contextual view cameras can be watched and recorded in the central control room at the same time as the operator is following and recording a live event close up with the PTZ Camera. Crime Clear Up and Key Performance Indicators – the surveillance operator is now more productive than ever before during an incident and in rapid investigations after a crime has been committed. This means that fewer operators are needed to clear up and deter more crime in larger areas without more installations, so providing a greater level of service for less operational expenditure. Video Management CCTV Training – the monitoring operator requires only limited, or no additional, training, depending on the application. Searching for, selecting and following suspects with the PTZ Camera becomes easier or may even be no longer required because it is completely automated. To use the local Viseum NVR requires no additional training because it is seen by the CCTV operator as part of the command control’s existing central storage. This narrated example shows how the correct situational awareness can automatically avoid the most mundane and the most complex security risks. Advanced Intelligent Video Analytics Software eliminates the need for local intelligent video analytics software at some of your camera installations. This presentation shows how Viseum is leading the video security industry with the most advanced and constantly evolving surveillance technology. Safe City CCTV Performance – The most advanced surveillance camera in the world working hand-in-hand with the most advanced command control and communications, produces the fastest and most accurate complete end-to-end Intelligent Video Management System and resulting security service. Independent of any infrastructure, Viseum’s Intelligent Video Analytics cameras provide constantly vigilant surveillance for the protected remote site 24/7/365. This uniquely produces close-up video of the incident even before the initial alarm is sent. The incident can then be reported in sufficient detail for it to be dealt with in the most rapid and efficient way possible. People Surveillance Video Management System – An important strength of Viseum’s CiVMS feature-rich platform is its flexible and intuitively optimized user interface intelligent algorithms. It changes itself dynamically based on geospatial information of an event and threat level e.g. terrorism, theft or misdemeanour. Also, operational maps of assets, galleries of faces, people and vehicles can be presented either based on predefined red, black and green lists, or dependent on each security personnel’s particular emergency control requirements. Example – the video wall can be populated with relevant information so that each surveillance operator will be capable of focusing their attention on priority issues and emergencies.